This is the story of GSD Niko sent in by Lisa L. - another story of a rescued German Shepherd puppy sent in to us by a reader that I wanted to share with you. Niko is a 4 month old GSD that was dumped off at a high kill shelter by a backyard breeder. 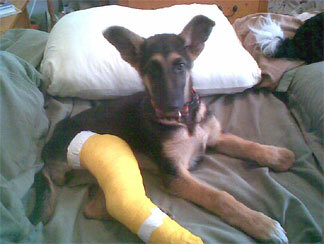 We assume the breeder didn't want the expense of correcting Niko's umbilical hernia and broken leg. We took Niko in and absolutely fell in love. She is sweet and playful and so happy to be with a family that loves her. Her best buddy is a 120 LB black lab named Bosley and she RULES him. Niko is out of her cast and is healing fast and completely. We have started basic training and are amazed at how smart she is. We'd like to take the time to thank our readers for sending in great German Shepherd stories to us every day. And I'd like to thank this reader, Lisa, so much for sharing your great story about rescuing your new German Shepherd puppy Niko. And thanks even more for your compassion in helping out this little girl when she needed it and had no one else there to help her. Your kindness will be paid for every time that little girl looks into your eyes. And I'd like to take the time to say thanks to all our visitors for reading along with us. BTW, please tell us also exactly what you think about the above story of GSD Niko by leaving some interesting comments below. If you get the chance, please come back often to see what else is going on in our growing German Shepherd Dog community. And if you get the chance please leave some comments, we'd love to have you join in with us here and place a video of your own or tell us your own GSD story in our sharing section. We'd also love to see your pictures.